With the introduction of the P100D with Ludicrous mode, Tesla’s Model S officially became a ’10-second-car’ with a 0 to 60 mph acceleration in 2.5 seconds. But the company kept improving on the software and was able to shave just over a tenth of a second with a software upgrade that has been referred to as ‘Ludicrous+’ mode. Now Motor Trend tested the latest version of the Tesla Model S P100D with the ‘Ludicrous+’ mode and claims two new records: 0-60 mph in 2.28 seconds and quarter-mile in 10.5 seconds. We are talking about a stock vehicle here. There’s been talk about a stripped-down Model S P100D accelerating from 0 to 60 mph in 2.0 or 2.1 seconds, but the vehicle tested by Motor Trend wasn’t modified. Launching a Model S P100D (weighing 5,062 with gear and driver) in full-on Ludicrous Easter-egg mode snaps your body in a manner that is utterly impossible to replicate in any other street-legal production car on normal tires and dry asphalt at a mid-$100,000 price point. 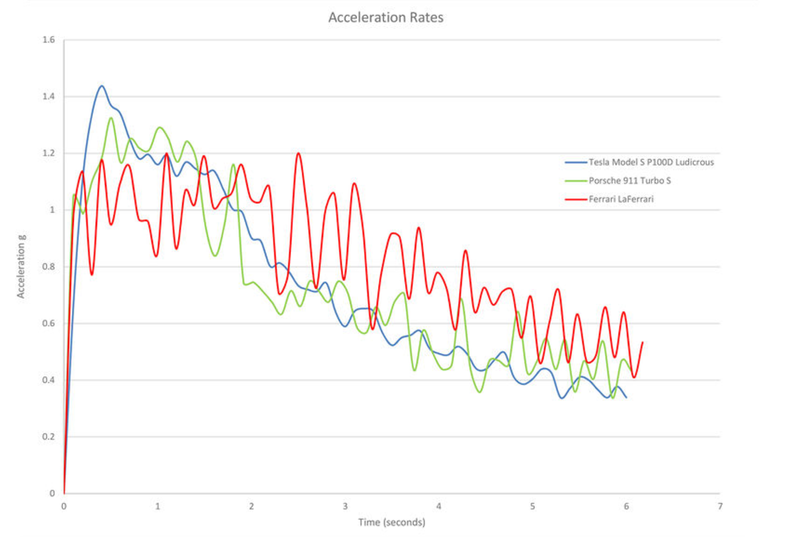 We regard 0–30-mph acceleration times as the benchmark for how hard a car launches, and this new Tesla gets there 0.05 second ahead of the next quickest (aforementioned) 0.92-second 911 Turbo S. The two run pretty even through 40 mph, after which the Tesla pulls ahead, maintaining a 0.2-second lead from 60 mph through 90 mph. The two cross the quarter-mile mark together at 10.5 seconds, at which point the Tesla is running 125.0 mph, and the Porsche is traveling 6.8 mph faster. There’s something that caught our eye and that definitely helped Motor Trend here. The lighter wheels are expected to improve the vehicle’s performance, but unless Motor Trend would test the P100D without them, it is hard to quantify the improvement. Nonetheless, it’s a new record that is putting a lot of vehicles to shame – at least when it comes to 0 to 60 mph acceleration. In term of performance, the Model S is already in a class of its own as a 4-door sedan, but it is also competitive with 2-door supercars in some aspects.